The Baba Farid University of Health Sciences is charging Rs 10,000 for rechecking Pre-Medical Examination Test response sheets instead of Rs 1,000 as per amendment notified by the state government. Rahul Singh Sidhu is a progressive farmer with a distinction, as he does not stick to two crops a year, but grows multiple crops on his 200-acre farms located at Muktsar and Kandukhera. Conflict among engineers of the Mandi Board and Public Works Department (Buildings and Roads) over the execution of development works in rural areas has come in the open. More than 1,000 youths have died due to the consumption of inorganic and organic intoxicants in the past one to two years. Even as the district BJP leadership, including MLAs and ministers, observed an undeclared boycott of Chief Minister Parkash Singh Badal, the latter said he would take all steps to save the “pious” SAD-BJP alliance. Punjab Pradesh Congress Committee (PPCC) working president Lal Singh today condemned the assault on a Ludhiana tehsildar by an Akali Dal councillor and his supporters and demanded the resignation of Chief Minister Parkash Singh Badal for his “failure” to maintain law and order in the state. What has happened to a tehsildar at Ludhiana two days ago and Local Bodies Minister Manoranjan Kalia earlier were not of-the-cuff or unrehearsed incidents. These were part of a design of a special class of politicians who have been calculatedly injecting violence in Punjab’s body politic and its social setup with the objective of not only exhibiting their political power but also their money power as well as muscle power. Akali councillor and Youth Akali leader Simarjit Singh Bains said today that he and his fellow councillors had no role in the stripping and attack on tehsildar Major GS Benipal (retd). Punjab is all set to become the first Indian state to fix minimum support price (MSP) for milk. Guru Angad Dev Veterinary and Animal Sciences University here has been assigned the task to work out the cost of milk production. It will help in determining the MSP for milk. The university has been given a grant of Rs 25 lakh for the project by the Punjab Dairy Development Board. The total cost of the project has been pegged at Rs 50 lakh. The Kartarpur Sahib Darshan Abhilashi Sanstha will organise a function in Pakistan in September to urge India and Pakistan to construct a corridor on the Indo-Pakistan border to facilitate Sikh pilgrims to pay obeisance at the Kartarpur Sahib Gurdwara. No Takht, apart from Akal Takht has any right to issue hukamnama to the Sikh community. 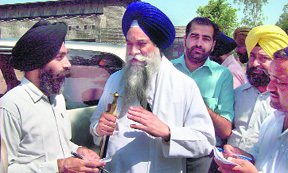 Jathedar of Akal Takht Giani Gurbachan Singh said other Takhts of Damdama Sahib, Huzoor Sahib and Patna Sahib could issue only regional hukamanamas. Instead of getting a criminal case registered against its fraudulent employees, who have allegedly embezzled Rs 44 lakh of the Paniar branch of the bank in this district, the Gurdaspur Central Cooperative Bank authorities have “rewarded” them by advancing loan to the tune of Rs 30 lakh to them. Amidst worsening power situation for domestic urban and rural consumers and prolonging power cuts in the state, the Punjab State Electricity Board (PSEB) has claimed that it has been giving eight hour “uninterrupted” power supply to farmers since June 10. Resentment prevails among officials of the Punjab Culture and Archaeological Department posted at Patiala’s historic “Sheesh Mahal” and “Quila Mubarak” museums as they have reportedly not got their salaries for the past more than 20 days owing to alleged withdrawal of drawing and disbursing (DD) powers from the curator. The Punjab government has decided to immediately clear the backlog of the posts reserved for the visually challenged and partially visually challenged in the state. 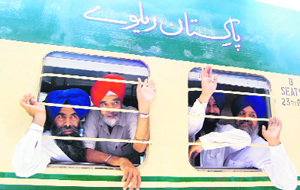 Punjab, especially Doaba, is the region from where most of the persons want to settle abroad for greener pastures. They do not even hesitate to go illegally to a foreign country inviting problems for them. Under the banner of Youth Welfare Federation (Girls wing), an organisation dedicated to the welfare of humanity, hundreds of women and girls, led by Gurcharan Kaur Mann, chairperson of the national committee of the girls’ wing of the federation, yesterday took out an awareness rally against drugs and female foeticide. They also urged people to raise their voice for eradicating these social evils from the state. To ensure transparency, accountability and quality in public works, Chief Minister Parkash Singh Badal yesterday directed the Principal Secretary, Local Government, to conduct an inquiry into the complaints of further sub-letting the contract originally awarded to the firm M/s ICOMM of Hyderabad to another private company for the execution of work relating to water supply and sewerage in municipal committees of Bathinda and Mansa districts. The Malerkotla police has finally registered a case under Sections 323 and 506, IPC, and Section 23, Juvenile Justice Act, 1986, against Jasvir Singh, a former teacher of local Sahibzada Public School and resident of Hathan village near here. The Directorate of Revenue Intelligence (DRI) today seized a huge haul of acetic anhydrate, which was to be smuggled to Pakistan by the Samjhauta Express or cargo train for producing heroin. The Baba Farid University of Health Sciences is charging Rs 10,000 for rechecking Pre-Medical Examination Test (PMET) response sheets instead of Rs 1,000 as per amendment notified by the state government. According to an amended state government notification on March 31 last year, it was stipulated that a candidate could on demand get his response sheet rechecked by making a payment of Rs 1,000 to the university within seven days of the examination. However, Baba Farid University of Health Sciences is demanding and taking a fee of Rs 10,000 from all the candidates who want to get their response sheets re-evaluated. Associate Professor at the Amritsar Medical College Dr Sat Pal said he had approached the university authorities to accept a fee of Rs 1,000 as specified by the state government but they refused to do so. Other candidates going in for rechecking of their response sheets also claimed that they were put at the mercy of the Baba Farid University authorities, who refused to listen to their appeals and did not consider their case after being presented with the amended notification in this regard. These candidates have since complained in this regard to the Principal Secretary, Research and Medical Education. The government had through a notification last year stipulated that all the candidates who wanted to get their response sheets rechecked would have to pay a fee of Rs 10,000 and those who wanted to see their response sheets would have to cough up Rs 5,000. However, following protests at the exorbitant rates being charged for these facilities, the state government had amended the notification and brought down the fee for rechecking at Rs 1,000. Meanwhile, Baba Farid Acting Registrar Dr Darshan Singh Sidhu said the new fee for rechecking of the response sheets had been fixed last year and this fee was being taken since the last PMET examination. When the new notification was pointed out to him, he said as far as the university was concerned, it had brought this fee to the notice of the students by listing it in its prospectus. Dr Sidhu said bringing down the fee to a nominal sum of Rs 1,000 would cause problems for the university, as it would not be able to handle the huge demand for rechecking of the response sheets. As many as 6,600 students sat for the PMET examination this year. Rahul (28), besides being a young progressive farmer of Malwa belt, is also a practising lawyer and president of the District Bar Association at Muktsar. He belongs to a popularly known Bhai farming family of Muktsar. His biggest achievement is that he has been able to maintain close ties with his workers. While talking to The Tribune, he says there are four families, who have been working in his 125-acre farm at Kandukhera for three generations now. He shares the profit with them and also looks after the welfare of their family, including education of their children. 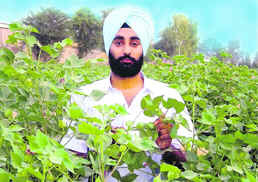 He has sown 125 acres under BT cotton and desi cotton. The Cotton Producers Sabha of Mumbai has honoured him with a national award and Punjab Chief Minister Parkash Singh Badal with the Progressive Cotton Producer Award at Bathinda for obtaining the highest yield of cotton. He has fruit orchards covering 60 acres on which different fruit crops, including kinnow on 16 acres, peach on 10 acres, plum on seven acres, guava on seven acres, ber on five acres and amla on two acres, are grown. The pear orchards succumbed to water-logging problem and he now cultivates 150 trees of jamun on beds that fetch him over Rs 2,000 per tree. He is well aware about the current field problems for which PAU scientists have recommended effective management technologies. Wild animals inflict harm by eating the new growth of kinnow. Rahul maintains an active liaison with horticulture experts of PAU at the main campus, Regional Station at Abohar and Krishi Vigyan Kendra, Muktsar. Another dimension of his agriculture is scientific dairy farming. He owns 10 Murrah buffaloes that he brought from Haryana and two hybrid cows. He is aware that the hybrid cows, besides being high-fat milk yielding are also heat tolerant. He has precise knowledge about the characteristics and requirements of elite breeds of buffalo and cattle. He is a source of inspiration for fellow dairy farmers of the region. His family ran a stud farm having elite breeds of horses, but now has closed his stud. He has also included agro-forestry as a component in his farming system. Last year, he had poplar plantation on five acres wherein he produced fodder for his cattle. He has now replaced poplar trees with eucalyptus. At Kandukhera village, 70 trees of teak that are over 20 years of age and 1,000 trees of dek are growing well. Rahul proudly shares that his family always uses homegrown vegetables, pulses and fruits. The government of India has deputed him as a member of a Doordarshan committee concerned with programmes aimed at rural development. He is a leading member of the Governing Committee of Dashmesh Medical and Dental College, Faridkot. He is planning to start an organisation aimed at providing healthcare services to the rural poor in which his wife, Dr Lakhbir Kaur, is rendering support. Rahul has appealed to the younger generation not to run to foreign countries. They should work in fields instead of doing menial jobs overseas. Rahul has acquired proficiency in scientific farming, be it crop growing, horticulture, stud management, dairy farming or the like. The Punjab Mandi Board Engineers Coordination Committee, at its meeting held today, has cautioned organisations and wings connected with the PWD (B&R) against going public on claiming right to execute all development projects in the state. Engineers of the PWD (B&R) have been demanding that all works, which used to be handled by them earlier, should be given back to them. They also want that no other department be allowed to have its own independent engineering wing. They have been critical of their diminishing role in development projects. They have been up in arms after many of the latest projects were taken away from them and given to various agencies, including the Punjab Infrastructure Development Board. “Instead, they should do some introspection and have their track record looked at again,” says Jatinder Singh, convener of the committee. “Let there be independent feedback from general public about the quality and completion of projects on schedule by various PWD (B&R) organisations. Had the department done its work by following quality controls, there should have been no need for 20-odd other departments to set up their own engineering wings”. The Mandi Board engineers claimed that not only had they more experience and qualified engineers among them, but also had been executing works on schedule by maintaining requisite standards of quality control. They held that the state government was distributing various new infrastructure development projects to engineering wings of different departments, including the Mandi Board, in accordance with their capacity and track record. As such there was no reason for PWD engineers and their various associations to resort to criticism in the media. Jatinder, who is president of the SDO Association, and Raman Kumar, who heads the JE Association, said public criticism of other engineering wings by the PWD (B&R) associations was creating misconceptions among general public about the engineering community as a whole. They said the present Chief Engineer of the Mandi Board had an experience of six years while superintending engineers had four or 12 years of experience. Similarly, executive engineers and subdivisional engineers, besides junior engineers of the Mandi Board, had adequate experience. On the other hand, 50 per cent of the executive engineers of the PWD (B&R) do not fulfil the basic qualifications to become regular in their posts. Except for a couple of chief engineers, others also do not possess adequate experience. Because of unavailability of engineers with adequate experience, qualified subdivisional and executive engineers were holding additional charges in the PWD (B&R). A report prepared after a survey by Romesh Mahajan, project director, Red Cross De-addiction Centre, here revealed that 300 deaths took place in less than two years in 15 pockets of urban and rural areas. Mahajan conducted the survey on the Deputy Commissioner’s instructions. He claimed that the number of youths, who lost life to drug addiction in two years in the district, was around 1,000 and it was rising. The figure will be higher if a comprehensive survey of the district was done. The situation had come to the point that there was no lane or bylane of any village or town of this district where one could not find a drug addict or where death due to addiction was not reported so far. The kin of the victims talked to alleged that drugs were available in the district as law enforcement agencies, including the police, had turned a blind eye to this deadly disease because the authorities seemed to appease political bosses instead of checking this menace. Mahajan said the initial report of the survey revealed that most of the victims, who died due to addiction, were between 15 and 35 years. He added that there were families that had lost more than one member to drug addiction. Most of the addicts had been using injections, while a small section of them was hooked to multiple drugs. The number of youths, who had died due to consumption of smack, was also significant. Lok Nath Angra, SSP, Gurdaspur, said drug addiction in the area was being curbed and property of smugglers confiscated and 125 smugglers bound down. Naresh Kumar Arora, SSP, Batala, claimed that most of the youths had been taking normal medicines for a kick and the police could not do much in such circumstances. He added that 17 cases were registered against inhabitants of the Gandhi camp locality of the town where addiction was rampant. Mahajan said a report of the survey would be submitted to the appropriate authority for action. Though Badal reached this district last evening and stayed at the Ranjit Sagar Dam guest house, no leader of the BJP, including Mohan Lal, Transport Minister, and Jagdish Shawney, Parliamentary Secretary, belonging to this district, neither received him at helipad nor met him at almost all functions held today. While admitting that some of the developments in the SAD and the BJP at individual level were unfortunate, he claimed that what had happened among Local Bodies Minister and BJP leader Manoranjan Kalia and SAD MLA Sarbjit Singh Makkar was not going to affect the alliance adversely. Badal was here today to hold a sangat darshan in view of the coming byelection to this assembly segment, which has fallen vacant after its MLA Partap Singh Bajwa was elected MP. Badal distributed grants to the tune of about Rs 7 crore among panchayats apart from laying the foundation stone of a bridge over the Beas on Dhonoa Pattan. Badal, when asked whether repeated “ill-treatment” meted out to BJP leadership, including its ministers and MLAs, could pose a threat to the state government, first said if such a situation arose, it would be taken care of. He hurriedly added that such a situation was not going to arise. “I am in touch with BJP leaders and I have been calling them twice or thrice a day. The steps are being taken to resolve the issue,” he said. “Neither will I separate the SAD from the BJP, nor will the BJP leadership be allowed to break ties with the SAD,” he asserted. Meanwhile, Badal was accompanied by Sewa Singh Sekhwan, former minister, who is a strong aspirant for party ticket to contest the byelection. In a statement issued here, Lal Singh said it was difficult to manage safety for common man in the state, where a minister could be assaulted in his official residence while referring to the case regarding Local Bodies Minister Manoranjan Kalia. Meanwhile, PPCC general-secretary Parminder Singh said it was perhaps for the first time in the history of the independent India that a minister was assaulted in his official residence and an officer was unsafe in his office. “The government has failed in its primary duty of maintaining law and order and ensuring safety of the citizens and its officers,” he added. Both leaders said if this trend was not curbed at this stage, it could lead to a chaotic state when goons of the ruling party would attack subdivisional magistrates, deputy commissioners and even chief secretaries. What has happened to a tehsildar at Ludhiana two days ago and Local Bodies Minister Manoranjan Kalia earlier were not of-the-cuff or unrehearsed incidents. These were part of a design of a special class of politicians who have been calculatedly injecting violence in Punjab’s body politic and its social setup with the objective of not only exhibiting their political power but also their money power as well as muscle power. At what scale the violence is being injected in the system, it certainly is a highly disturbing development. There is an expanding class of politicians who bully institutions to squeeze maximum out of them and subdue their administrators to the extent that they should deliver favours to them and dare not to act against them. The current cycle of violence in Punjab started in the last elections to municipal corporations. It also happened at a large scale in the zila parishad, block samiti and panchayat elections. No one knows better it than the BJP about what happened in those elections in Tarn Taran, Bathinda, Gurdaspur and Amritsar districts. As three persons were killed and more than 100 injured in the zila parishad and block samiti polls in May, 2008, repolling had to be held in 17 constituencies. Most of these violent fights during the civic body polls had occurred among supporters of the SAD and the BJP. Besides burning of the BJP MLA Anil Joshi’s car, several other vehicles were damaged in a fight among activists of the SAD and the BJP near Tarn Taran. A senior Akali leader was accused of engineering that spell of violence. There used to be strong bonds of fraternity in villages. But, that has been destroyed, perhaps forever, as politicians have sown seeds of violence deep in the soil of villages just to serve their vested political interests. From election arena, violence has come to offices. The tehsildar of Ludhiana is not a first official to be hit violently and humiliated to the hilt. What was new in his case was that those involved in attacking him were so daring that they even challenged the might of the state, which at a district headquarters is represented by a Deputy Commissioner and along with him by the SSP. Earlier, district development and panchayat officer Ranbir Singh Mudal’s ear was chopped off in July, 2007, in Gurdaspur district. The DDPO was assaulted when he had gone to hold the auction for a panchayat land on lease. A senior Akali leader’s son was blamed for the attack. Punjab has not only slipped from the rank of number one state to an insignificant position in the country, it has also slipped into vortex of violence. Politicians of all main hues are responsible for leading Punjab to such condemnable state of affairs. In a statement here this evening, Bains said the sequence of events in the entire case was falsely made out by the tehsildar and certain police officials to bring bad name to SAD leaders Parkash Singh Badal and Sukhbir Badal. Bains claimed that he was not even present at the office when the tehsildar was assaulted. He reached the place only after residents called him up and said they were staging a dharna in protest against ‘‘excesses’’ of the Tehsildar. The SAD leader also claimed that that a person belonging to Scheduled Caste had gone to get his document registered. The tehsildar used casteist remarks against him and pushed him out of the office. This angered the residents, who beat him up. He added that after he and councillor Kamaljit Singh Karwal were called up, they reached office and found DC’s vehicle gheraoed. They helped the DC to come out of office safely. However, they were instead booked for this gesture, he added. Bains also refuted allegations of their involvement in the stamp paper scam. He alleged he and his supporters were being falsely implicated in the case. Punjab is all set to become the first Indian state to fix minimum support price (MSP) for milk. Guru Angad Dev Veterinary and Animal Sciences University here has been assigned the task to work out the cost of milk production. It will help in determining the MSP for milk. The university has been given a grant of Rs 25 lakh for the project by the Punjab Dairy Development Board. The total cost of the project has been pegged at Rs 50 lakh. Inderjeet Singh, Director, Punjab Dairy Development Board, said the board would release the remaining amount once the university chalked out a detailed plan and exhausted the present funds. The university had submitted a project on “Economics of Milk Production and its Regular Monitoring in Punjab” to the board. Dr OS Parmar, Dean, College of Dairy Science and Technology, said there was no mechanism for determining the cost and procurement price of milk. “At present, the procurement price of milk is determined arbitrarily without considering the realistic estimates of the cost of milk production, which, according to a majority of dairy farmers, are not conducive for the growth of dairy sector,” he said. Giving details of the project, Inderjeet said the realistic cost estimates of milk production would require a comprehensive survey of a large sample of dairy farms representing various categories of land holdings, herd size over different seasons and agro-climatic zones of Punjab. Their expenditure would be worked out and information on input/output items related to cows and buffaloes would be obtained from milk producers at monthly intervals throughout the year. Profitability of dairy enterprises will be worked out for per animal and per unit of milk on a daily, monthly and yearly basis. The regionwise and seasonwise cost of milk production estimates would also be pooled for the state as a whole and would be made available to the Punjab Dairy Development Board, he informed. “This will help the government and other organisations in the public and private sectors to properly plan and regulate dairy development programmes, including the incentives to be given to the dairy sector (farmers and dairy plants), to supply quality milk to the consumers at affordable prices without undermining the interests of the farmers,” he said. The sanstha has been seeking construction of the corridor on the border from Dera Baba Nanak in India to Kartarpur Sahib Gurdwara in Pakistan since 2001. It held ardas on Baisakhi, eight years back at Dera Baba Nanak Gurdwara for the corridor. Since then, it has been organising ardas at Dera Baba Nanak every month on “amavasya”. The sanstha has decided to hold the 100th ardas at Dera Baba Nanak on June 22 and a function at Kartarpur Sahib in Pakistan on the anniversary of Guru Nanak Dev on September 22, said chairman Kuldeep Singh Wadala, also senior Akali leader. Wadala said a seven-member deputation would go to Pakistan to invite President Asif Ali Zardari and Prime Minister Yousaf Reza Gilani to the function. A similar function would be held at Dera Baba Nanak in India on the birth anniversary of Guru Nanak Dev on November 3. Wadala said a 100-member committee would be formed to organise the functions. He said Dr Manmohan Singh had assured to work in the direction of the corridor during his meeting with the delegation of the sanstha on December 31, 2004. Wadala said he had met Pakistan PM and other authorities there during his visits to Pakistan some time back. Pakistan had started constructing a road leading to Kartarpur Sahib Gurdwara, he added. He was here to preside over concluding ceremony of summer camp held at Dasmesh Martial Arts Acadmey. Akal Purkh Ki Fauj had organised this summer camp. Talking about the incidents like Dera Sacha Sauda controversy, Baba Bhaniarewala’s rising and now replica of Darbar Sahib coming up in Mastuana, he said such issues came to fore only during the SAD rule in Punjab as anti-panthic forces made it an agenda to defame the party. “The anti-panthic use these tactics (of raising controversial issues) during the SAD regime only so as to topple the government,” he said. On issue of replica of Darbar Sahib coming up in Mastuana, the Shiromani Gurudwara Parbandhak Committee (SGPC) has been directed to ensure that design of building at Mastuana is changed. He distributed prizes to 350 students in age group of 14 to 20 years participating in the camp. Harmeet Singh was named best boy camper, while Harvir Kaur was selected as best girl camper. The convener of Akal Purkh Ki Fauj, advocate Jaswinder Singh said students from Punjab, Haryana, Himachal Pradesh and Jammu and Kashmir had participated in this camp. Official sources said three employees of the Paniar branch of the bank, namely Manager Manjit Singh, cashier Avtar Singh and peon Tilak Raj, committed a fraud of about Rs 44 lakh with the bank by making fake withdrawals from the same. When the fraud came to light and the state-level authorities directed the district-level authorities of the bank to take legal action against the fraudulent employees, apart from placing them under suspension, the district-level authorities advanced a loan of Rs 30 lakh to Manjit Singh and Avtar Singh. Chairman, Central Cooperative Bank Limited, Gurdaspur, Vijay Partap Puri said he, along with six directors of the bank, had lodged a complaint to Managing Director (MD), Punjab State Cooperative Bank Limited, Gurbir Singh Mangat and alleged that the fraud was a mere tip of the ice-berg and if checking of all 44 branches of the bank dotting the district was carried out, the fraud could run into crores of rupees. He added that bunglings had been made in the purchase of furniture, stationery and other items, apart from the advancement of loans to the tune of crores of rupees in all branches of the bank, by violating the norms in this district allegedly by District Manager Sarbjit Singh. He said they had urged the MD to transfer Sarbjit from the district and launch a comprehensive inquiry to bring the truth to the surface. They added that if such an action was not taken, the higher authorities would be left with no other option than to close down the bank branches. However, a senior official of Punjab State Cooperative Bank Limited, Chandigarh, said almost all top management officials of the bank had been feeling helpless to take action in this case due to “pressure” from one of the senior members of the Punjab government. Sarbjit, while denying his involvement in the case, claimed that he had moved a formal complaint to the SSP, Gurdaspur, to register an FIR against the employees who had committed fraud. What has perturbed both domestic rural and urban consumers was that despite PSEB managements’ earlier pre-poll promises that people of Punjab would not face any power cuts, people were reportedly made to bear eight to 12-hour long power cuts in different areas of Punjab. The PSEB, however, has now attributed the situation to shortfall of rain in the southern states. Harinder Singh Brar, chairman, Punjab State Electricity Board, has said that the board has been supplying eight hours uninterrupted power supply to farmers since June 10. He said the AP consumers have been divided into four groups and in each group the circles of various zones have been included. He said in first group Khanna, Tarn Taran, Ferozepur and Nawanshahr circles were included. In the second group, Jalandhar, Hoshiarpur, Ludhiana and Sangrur circles, in the third group Faridkot, Amritsar, Muktsar, Mohali, Gurdaspur and Ropar circles and in the fourth group Patiala, Bathinda and Kapurthala circles have been included. He said these groups had been formed in such a way that there was equal load on transmission lines all over Punjab. Brar further informed that there had been deficient rainfall in southern states and the relief, which the northern region used to get from southern states in these days of summer, was absent this time. The board authorities added that due to increase in load of every state due to high temperature, the frequency of grid was hovering near 49Hz, which favourably should be near 50Hz. As a result, additional unscheduled power cuts are being imposed all over Punjab. Every effort is being made to impose equal cuts on all categories of consumers across the state. He said there was no discrimination to any category and power cuts were being imposed even in the PSEB colonies, including Power Colony No. 1 at Patiala, where members and chairman of the board resided. He further said to bridge the gap between demand and supply, PSEB had to increase weekly-off on Arc Induction Furnace from two to three days and on category-II feeders from 33-hour to 48-hour. He said these restrictions would be in force up to June 30, which would be reviewed thereafter. Engineer (Generation) of the PSEB GS Sra said both the Guru Hargobind Thermal Plant, Lehra Mohabat and Guru Nanak Dev Thermal Plant, Bathinda, were running to full capacity. More than 65 officials of the department, including chemists, conservators and gallery assistants and “quiledar”, were deployed to undertake the conservation work at the “Sheesh Mahl” museaum and at the “Quila Mubarak” of the erstwhile Patiala Royal family to take care of valuable artifacts preserved at these places. It was for the first time these officials had failed to get their salaries allegedly due to some legal wrangling surfacing after according of DD powers to the assistant conservator in place of the curator by the top department authorities. The “uncalled for” exercise undertaken by the department has invoked certain objections by the office of the Accountant General (AG), which has not given sanction for release of employees’ salaries. “I have to deposit school fees of my son. From where would I give the fees,” rued an employee while speaking to The Tribune on condition of anonymity. Similarly, another official said he had to repay an installment for his scooter loan. While the director was not available for comment, a senior official of the department confided that the entire confusion was created for the DD powers were given to a superintendent-level official. Disclosing this here yesterday, Technical Education and Industrial Training and Social Security Minister Swarna Ram said directions to all Administrative Secretaries and Heads of the Department were given to intimate the position of vacant posts in their departments concerned reserved for the visually challenged and partially visually challenged so that these posts could be filled on top priority. The minister also asked the Secretary Social Security to undertake an exercise to identify the posts where such visually challenged persons could be adjusted as they had tremendous capabilities and capacities. Swarna Ram also asked the Secretary Social Security to personally visit the state institute for blind at Jamalpur in Ludhiana to have first hand information about the short-comings in the institute in terms of infrastructure and staff besides the hardships faced by the visually challenged students. Now, the Union Ministry of Overseas Indian Affairs and the International Organisation for Migration have decided to make the general public aware against the dangers of illegal migration. They have taken the help of the Centre for Research in Rural and Industrial Development (CRRID) for spreading awareness among the general public about the benefits of legal immigration through road shows. Krishan Chand and Pawan Kumar of CRRID said these road shows would be held in villages falling under Nakodar, Jalandhar East, West, Phillaur, Shahkot, Nurmahal, Lohian, Rurkan Kalan, Adampur and Bhogpur blocks from June 22 to July 24. Earlier, the girls’ wing of the federation also organised a function at the local Baghikhana ground against drugs and female foeticide. It was presided over by Neeru Ohri, wife of Sangrur Deputy Commissioner VK Ohri. Neeru said they could play a vital role in inspiring their husbands, brothers and other relatives to give up drugs. The case has been registered following an inquiry conducted by AIG (Crime) in a child-beating case. DSP Gurpreet Singh Sikand, while talking to The Tribune on Saturday, said Dinesh Bhardwaz of Sazida Nagar, Malerkotla, had complained to the Punjab DGP that Jasvir had beaten his son Sahil Bhardwaz, a student of Class VI in Sahibzada Public School, mercilessly with a stick and threatened to kill him if he disclosed this to his parents. After this a medico-legal report was registered in the local Civil Hospital on June 3, 2008. But the then inquiry officer registered a case under Sections 107 and 151, CrPC. Dinesh Bhardwaz was not satisfied with these sections and demanded further inquiry. The inquiry was conducted by the AIG, Crime, who ordered the Sangrur SSP to register a case under Sections 323 and 506, IPC, and Section 23, Juvenile Justice Act, 1986. The AIG also directed the SSP to take action against the inquiry officer for not registering the case under proper sections. After receiving orders from the Sangrur SSP, the Malerkotla police has registered a case against the teacher under these sections. Acetic anhydrate is used as catalyst for converting morphine into heroin. The contraband weighing about 118 kg worth Rs 11.80 lakh was seized near the Jahajgarh area, when two accused identified as Sukhdev Singh and Gurnam Singh, both residents of border Ranike village near Attari, were loading the cartons into an autorickshaw.